Peter Bryer: Mobile Foresight: What's in store for Microsoft? The answer: lots of elbow room. What's in store for Microsoft? The answer: lots of elbow room. Nothing to see here folks. Nothing at all. Sometimes you can't beat boots on the ground when doing research. 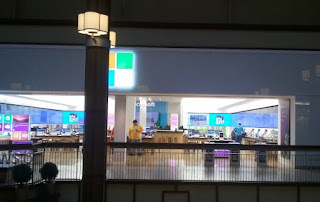 As a follow up to a Microsoft Store visit I wrote about last June (see "Windows Shopping," June 2012), I did some real-world stalking of the same store at an upscale suburban U.S. mall for approximately an hour and a half on a mundane, gray February evening. About eight months after its grand opening and with a few more news-worthy products to show off, it was worth checking to see if floor traffic had picked up. Again I will contrast this store's activity with the activity at the busy Apple store a few doors down. There was sincere interest, there was loud talking, and best of all for Apple, there was real retail cash flowing. But wait, there is hope for Microsoft and their stores: there was a constant stream of youngsters playing with Xbox and Kinect. 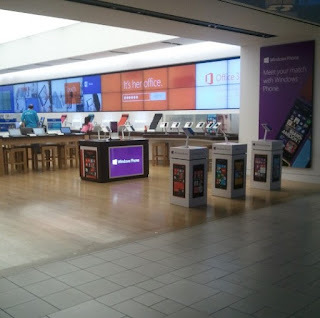 In fact, Microsoft would be wise to refocus the entire chain of Microsoft stores as "Kinect Xperience" stores. But then again, any company that would give the world the vomit-inducing "Windows 7 Launch Party" doesn't know much about marketing. Nor much about modern, Western human behavior for that matter. I've seen this sort of thing before and I would bravely predict that Microsoft would begin shutting down their chain of emptiness over the coming two years if it weren't for the fact that the company has announced they plan on adding another 75 stores over the next three years to bring the total to more than 100. Yes, throwing good money after bad is what big, slow-moving companies do best. Nonetheless, as I said last June, for analysts the stores make a great apathy indicator and could be a taste of things to come. Microsoft and its value-chain partners would be wise to pay attention to this apathy and adjust. And so would investors. Microsoft is Nokia in 2009. They refuse to realize they botched Windows 8 and created the wrong type of tablets. Like Nokia, they are going to double and triple down pushing failed products.